This column shows the basic "single" version used on the shortest lines. This column shows the version used on the longer lines. This has two benefits; (i) you don't have to thread loads of single line when forming the knot, (ii) it leaves much less line dangling. (1) Run the end of the line up through the eyelet. Now pull it down to the left as you take up the slack in the "standing line" under the hull. This starts just like the basic version on the left. 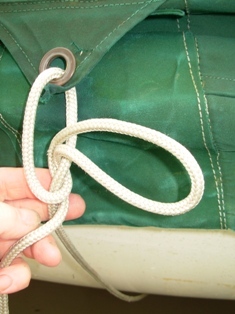 Form a closed "bight" (loop) in the line to create about 18 inches of doubled line which will be used to tie the knot. then begin to pass it from right to left behind the standing part (ie against the canvass). (3) As you do so, bring the end toward you through the loose loop which had formed. The bight is now your "Working end". (4) Take up the slack. (5) Holding the end a little lower than before, repeat (2) & (3), ie. begin to pass the end from right to left behind the standing part, as in (2), and as you do so, bring the end through the loop you have just created (as in 3). (5) Holding the bight a little lower than before, repeat (2) & (3), ie. begin to pass it from right to left behind the standing part, as in (2), and once again, as you do so, bring it through the loop you had just created (as in 3). Re-check the standing part (under the hull) is not slack. Tuck any excess line under the canvass and into the boat. When you are confident with this, try the version in the right-hand column. For an alternative explanation, see The Clove Hitch - It is effectively the same knot, but it the above case it is tied on the standing part of the rope instead of around a post or ring. In a situation where the eyelet, or other orifice is larger, you could save effort by creating the bight at the outset. This is not practicable or advisable with our cover, due to the relative sizes of eyelet and line.